Fiber supplements can be of great help when it comes to weight loss. This is because certain dietary fibers promote appetite suppression. What this means is that they help you to fight cravings and eat less throughout the day. Supplements like Skinny Piggies are specifically made to help you lose weight. This fiber supplement is a natural hunger suppressant taken 30 minutes before your meal along with a full glass of water. It turns into a gel in your digestive tract and makes you feel full without feeling bloated. This helps you to cut your daily calorie intake and thus promotes weight loss. Love eating tasty dishes but also wish to shed some pounds? Losing weight is all about creating a negative caloric balance which means most likely you may feel hungry day and night. Thankfully, there's an original product that can change that: Skinny Piggies. What is this? Let's give you the facts you should know first. In order to burn more calories than you take in, you need to increase the amount of exercise or reduce how much you eat. To get faster results, you may really want to do both. Skinny Piggies help you eat less and lessen your caloric intake which makes achieving loss of weight easier. Include an additional daily physical activity in order to help step up the weight loss process. If only fat loss were that easy! Even though cutting back on your daily calories seems effortless, in fact your carbs cravings are more likely to keep you thinking about sugar treat night and day. And that's when Skinny Piggies diet gummies can help you. Skinny Piggies are fun, sweet healthy treats you won't need to feel guilty about! Enjoy the delightful taste of these gummy fiber supplements and let them do the rest of the work. So, exactly what are these gummy supplements good for? 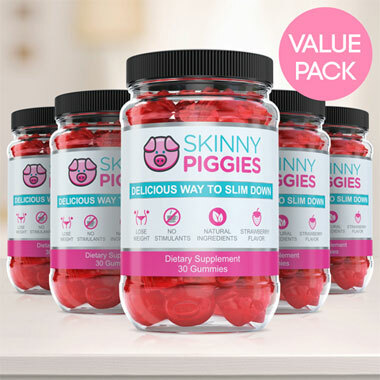 The concept of Skinny Piggies diet gummies is pretty straightforward. Your hunger is caused by 2 key ways: the number of calories you eat and the presence of food in your stomach. After a large meal, your stomach stretches in size from the food pressed up against the walls, which results in you feeling full and you stop eating. When you take a Skinny Piggy about a half hour prior to your meal with a cup of water, it will gently expand to a gel, activating food sensors in the stomach, telling the brain that you just consumed a lot of food. With this, when you do eat, you are already partially full and eat less calories. This way you can avoid appetite and keep eating less, all without seeming like you're dieting. When you eat Skinny Piggies gummy fiber supplements before eating, they surround your food in a gel. That slows the release of the carbs you eat into your blood. This helps keep your blood sugar level much more steady and makes sure that your body remains in weight loss mode all day. It can even make your workouts feel a lot easier. 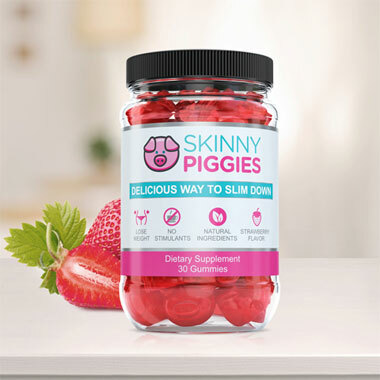 You might be wondering, what's so different about Skinny Piggies versus the other weight loss gummy products you see in stores? First off, our product contains no artificial ingredients. Just take one look at your average weight-loss supplement and you'll see a whole line-up of chemical names that you can't pronounce. Skinny Piggies have absolutely no artificial additives - in fact, you can pronounce all the active ingredients. The wholesome, natural ingredients used in Skinny Piggies also have further benefits including support for healthy looking nails and hair, powerful anti-aging properties, and healthy looking skin. Besides that, Skinny Piggies have no caffeine. This is a crucial point to consider because if you take caffeine, not only you are risking suffering from exhaustion and tiredness afterwards, but it restricts you from using it at night. Use a stimulant based fat burner too close to bed time and you won't sleep all night. With Skinny Piggies, you can eat them even at night without a problem. There are no limitations with these gummies. And lastly, what other weight loss pill is as tasty as a mouthwatering fruit gummy? Losing fat is a challenge, but yummy Skinny Piggies are ready to make the process more easy. 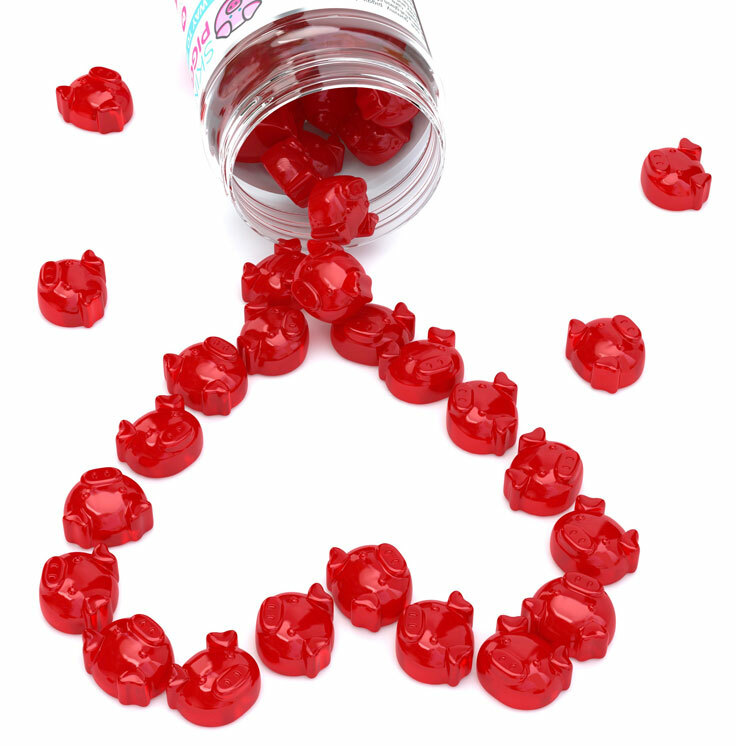 You will love the fruit flavor of these gummies, so forgetting to eat them daily won't be a problem. 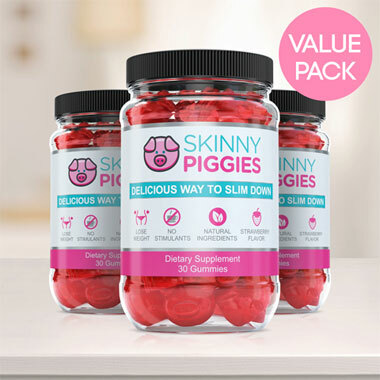 Easy to take and satisfying, Skinny Piggies are dietary supplements that is fun to use.